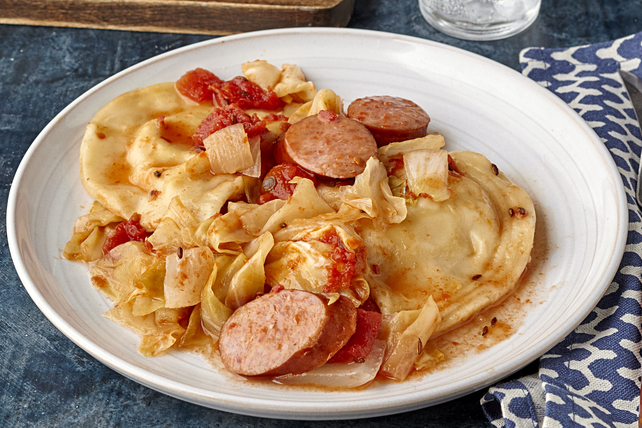 Get two classic Polish dishes in one with our Slow-Cooker Kielbasa & Pierogi Casserole! Prep time for this tasty slow-cooker pierogi casserole is only 15 minutes. How easy is that? Combine tomatoes, ketchup, vinegar and caraway seed. Layer half each of the cabbage, onions, sausage, tomato mixture and pierogies in slow cooker sprayed with cooking spray. Repeat layers; cover with lid. Prepare using your favourite variety of pierogies. For easy cleanup, line slow cooker with a disposable slow-cooker liner before using as directed.